Max and I attended our "Birth Journey" class at the Babymoon Inn this week. It promised a "unique labor simulation experience" which was a perfect way to describe it. After going over various pain-coping techniques, all the daddies (yes, the dads) were blindfolded and given handfuls of ice to hold (a.k.a. the labor pains). The soon-to-be mommies were then given the opportunity to walk the dads through the "labor pains" employing all the pain-coping strategies until it was time to drop the ice. Apparently the way the mom coached the dad is subconsciously how she would like to be coached in labor. I thought the girls were getting off easy, but we were then blindfolded and had to make our way to bowls full of ice, where we submerged both hands and let the dads help up through the pain. Although ice pain is definitely not labor pain, the idea was that working through any kind of pain should give you a better idea of which coping strategies work for you and which don't. Yoga breathing is still my number one. We also learned this week that baby is head-down (yay!) and that my body is totally prepping for labor. Baby wanted lots more vanilla steamers this week, plus cooked sushi with ginger and chocolate-chip cookie dough ice cream. 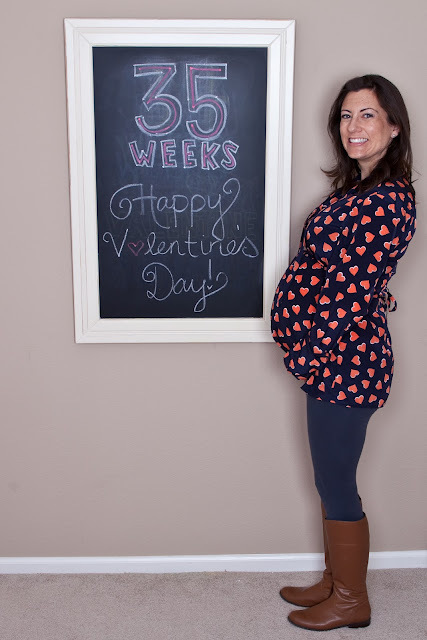 This week also marks the milestone: 35 Weeks down, 35 Days to go!